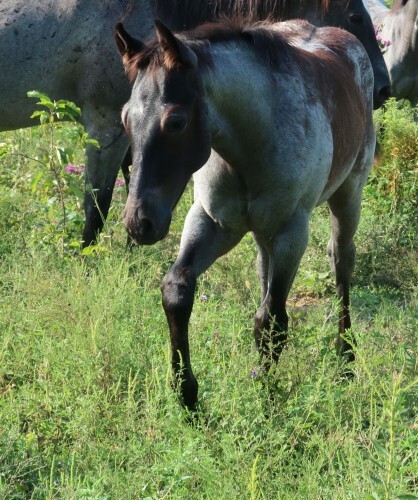 TRUE BLUE ROAN COLT BY AUTOMATIC CAT!!! AQHA name pending "AUTOMATICALLY BLUE"
This guy really deserves the name Romeo, he’s as sweet as can be and has big soft eyes. He has a certain presence about him that is undeniable. This colt is true stud prospect or an amazing show prospect. He is a true blue roan, 5 panel nn by parentage and has very correct confirmation. On top of that, he has an amazing pedigree. Sired by up and coming stallion, Automatic Cat!! Automatic Cat is by Smooth As A Cat (LTE $500,000+, NCHA and NRCHA top 10 sire!!) and out of the #4 all time leading dam AUTUMN BOON (LTE $250,000+)!!!!! This colts dam is a stout 14.3 true black, her sire is Midnight Haiadaway, an NRHA/NRCHA $ earner and producer, who is by Haidas LIttle Pep!!! With his pedigree, presence, build, and color, Romeo has the potential to go cutting, reined cow horse, or even ranch horse/versatility! Whichever direction he goes, he will be the most eye catching horse in the pen!!! Romeo is 5 panel NN by parentage through AQHA. Romeo is color tested HOMOZYGOUS BLACK (this means he cannot sire a red foal!!) EEaaRnrn!!! What a stallion prospect!! !